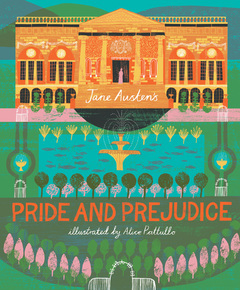 Fans of Jane Austen’s timeless works will embrace the re-imagined version of Classics Reimagined, Pride and Prejudice, including stunning illustrations from Alice Pattullo. Pattullo’s art expounds on and enhances the story for truly a collector’s edition of one of literature’s most famous love stories. Here are eight drawings from this dynamic work to transport you back to the world of Elizabeth Bennett and Mr. Darcy. A beguiling and modern illustrated edition of a classic tale. Enjoy Jane Austen’s witty novel of love and misunderstanding as you’ve never seen it before! Alice Pattullo’s colorful interpretation of Pride and Prejudice follows the romantic adventures of Bennett sisters, Mr. Bingley and his dour friend Mr. Darcy. Her folkloric, multi-faceted images, breathe new life into this engaging romantic novel, making it a collectible for book and art lovers every where.